Over the last few months, the good people over at Rooster Teeth (the group behind machinima hit Red vs Blue) have been producing their own original game and anime-inspired web series called RWBY. And while it's hardly deep, its first season provides enough action and imagination to draw anyone in. But rather than a simple retelling, RWBY uses these famous tales as building blocks for a world that appears both familiar and magically new. Concepts, names, and character designs all serve to set the stage in various nostalgic ways but the story remains completely new and original. All in all, it makes for a captivating world you are just dying to know more about. As expected from a show from Rooster Teeth, the dialogue of RWBY is often a highpoint. The banter between main characters—as well as that between the heroes and the villains—is both charming and witty in turns. The best points of dialogue come in the form of snappy one-liners that appear suddenly in the middle of an otherwise normal conversation. Even when dealing with exposition dumps, there is usually a verbal gag in there to get a laugh out of you and keep you from getting bored. As it is directed by Monty Oum, the guy behind Haloid and Dead Fantasy, it should really come as no surprise that the fight choreography in RWBY is excellent and stands far above any other aspect of the series. While not present in every episode by any means, the battles in RWBY serve as excellent climatic payoffs for the season's two arcs. These scenes are so over-the-top and visually stunning that they would make the people behind the Devil May Cry series' more ridiculous cutscenes blush. Moreover for video game fans, if you watch carefully you may recognize a combo or two from your favorite fighting games. Perhaps the best aspect of the fight choreography is how visually distinct each character's style is. This comes largely from the fact that each character has a unique, imaginative weapon. 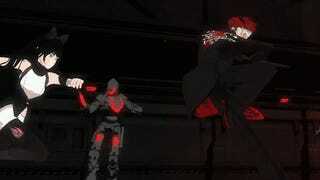 Ruby has a gun-scythe, Weiss a magical sword, Blake a gun-whip, and Yang a pair of explosive gauntlets. Of course, there are few things in the series as well realized as Nora's sledge hammer-grenade launcher (which may single-handedly redefine the term “over-the-top”). Simply put, as chaotic as the battles could appear, it's impressive how easy it is to follow the action. The biggest drawback in doing a micro-series, where each episode has to be wrapped up in a few scant minutes, is that there is precious little time for good characterization—especially with a main cast of eight. So when it comes down to it, in this two hour and fifteen minute season, many of the characters are left as little more than walking clichés with practically nothing in terms of real depth. Some of the heroes—Ruby, Blake, and Jaune—are starting to develop as characters but the rest of the cast can be summed up in one word each: stuck-up, easy-going, noble, love-struck, and silent. And the villains—as even their motivations have yet to be explained—tend to be less of a threat and more like practice dummies to be beaten up. However, that is not to say that the characters are unlikable or unsalvageable. Rather, this first season has done an adequate job of building a character base—full of stereotypes as it may be—that subsequent seasons can build upon. In general, the art style of RWBY (computer animated anime-style) works quite well—as long as you can’t see the feet. When the characters are walking or running, they never seem to move the right distance for the size of their leg movements. It makes them seem like they are either trying to run on ice (and are getting hardly anywhere at all) or are just gliding across the ground like on roller skates. And while the fight scenes by their over-the-top natures obscure this annoying flaw, it is particularly noticeable in any wide shot where the characters are moving around outside of battle. All in all, RWBY is a good first step into a world of possibilities. It draws you in with the fight scenes and then gets you invested in the characters and the world little by little as the story moves along. If you love amazing fight choreography, you'd be doing yourself a great disservice if you didn't give RWBY a watch. RWBY was released on DVD and Blu-ray on November 12, 2013. It can also be watched for free on Crunchyroll, Youtube, and the official Rooster Teeth Website.